The CW has unveiled an unprecedented picture of Winter Premiere of Season 7 of "The Vampire Diaries" with Damon. While the first part of the season 7 of The Vampire Diaries ended, production has unveiled a new photo of Damon, immersed in full Civil War. 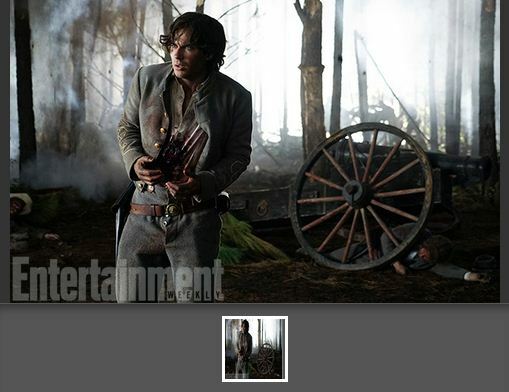 Damon in grave danger in the second part? If one believes the departure of Ian Somerhalder rumors and the latest adventures of his character, everything suggests that Damon will face great dangers in the Winter Premiere. He seems lost and the next episode will be dedicated to him. The producer Caroline Dries explained to Entertainment Weekly that it was "the first time in the series one episode focuses entirely on Damon. In this episode, he is in every scene. Maybe not all but a lot of scenes. "You can see the photo at the bottom of page. Caroline Dries continues insisting on the trials that will cross the brother Stefan: "This episode plunges the audience head-first in a typical brothel Damon. It's an exhausting observation, frustrating and often hilarious one of our favorite characters and is one of the most hurt. And it happens in the dark psyche of Damon Salvatore, redemption is not something easy to find. " The other producer, Julie Plec, had mentioned in an interview a few weeks ago at the Hollywood Reporter, the events of Episode 10: "The episode 10 will be dedicated to Damon. And we will review some of his memories that date back to the time when he was not yet a vampire. Any color is linked to his childhood and his relationship with his brother and his mother. "